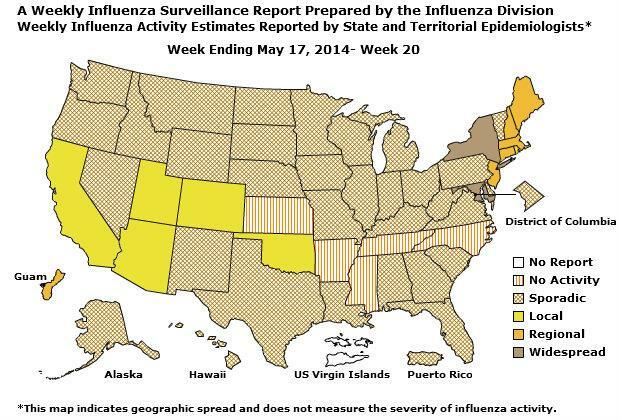 The CDC provides a weekly Flu Activity Map which shows the severity of flu outbreaks in each state across the U.S. The Flu outbreak maps are updated only during flu season (October through May). These maps are typically two weeks behind real-time, as it takes time and resources to tabulate hospital and health department data from across the country. The Department of Health and Human Services has created a pandemic flu web page that includes a map of confirmed pandemic bird flu cases across the globe. This map will be updated as new information becomes available. The CDC provides a new weekly Flu Activity Map which shows the severity of flu outbreaks in the US, including the recent outbreak of H1N1 Swine Flu. Theis map is typically two weeks behind real-time. Northwestern University regularly maps the projected number of H1N1 flu cases across the United States. These projections are updated every 24 to 48 hours. HealthMap integrates outbreak data from news feeds and surveillance agencies, and combines them into a real-time worldwide view of the state of infectious diseases. HealthMap provides a starting point for finding specific information on emerging infectious diseases for public health officials and international travelers. This map is updated as new information becomes available. The USGS provides mosquito tracking and outbreak maps for the West Nile Virus, Encephalitis (EEE, WEE, SLE, and LAC), and the Powassan Virus. These maps are updated as new information becomes available. View the Current Situational Report on avian influenza, courtesy of the CDC this map will be updated as new information becomes available. The Washington Post hosts an interactive map on the spread of bird flu throughout the globe.